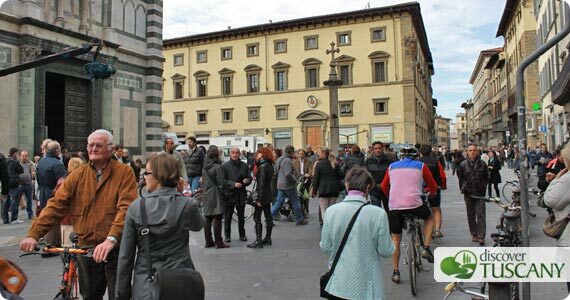 Blog / Florence / No more cars in Piazza Duomo! No more cars in Piazza Duomo! Yesterday was a beautiful day for Florence and for both residents and visitors alike. Aside from the near perfect weather, Piazza del Duomo officially became pedestrian only and was closed off to the traffic that for the last 60 years has wound its way around a corner of one of the most famous squares in Italy. The smog blackened facades of the Baptistery and Cathedral were marked by the passage of over 2.100 buses and hundreds of taxis, scooters, cars and trucks through the square every single day. Buildings and pedestrians alike will certainly benefit from the cleaner air and diminished noise of traffic. In general, everyone seems happy with the move announced in a surprise news conference just a little over a month ago by recently elected major Matteo Renzi. 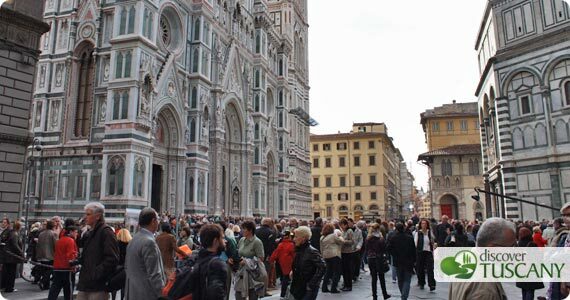 Visitors will certainly enjoy being able to gaze at the magnificent facade of the Duomo from a new angle without fear of oncoming cars or buses. We joined in the celebration yesterday in Piazza Duomo and certainly appreciated the extra space – the square just seemed so much larger once the streets were reclaimed as pedestrian areas. Lots of families with children and strollers, cyclists and tourists were about, many taking the chance to take in the free guided visits offered of the Duomo and Opera del Duomo museum, the parade in historical costume and free roasted chestnuts and balloons which were being distributed. The move has obviously meant a speedy replanning of the bus lines that went by Piazza Duomo, many heading from/to Piazza San Marco by way of the Fortezza da Basso to get to and from the SMN train station. It will take awhile before everyone gets used to the changes – beware as not all bus stops have been updated to reflect the new routes! An example: Bus #7 which heads to Fiesole now starts in Piazza San Marco and not at the SMN train station. With so many buses going through San Marco, it wasn’t clear where the stop for #7 was (it seems you have to get on at the stop in front of the church but we still aren’t positive where the official “capolinea“, or start of the line, is). We’ll have to wait and see how quickly the changes are understood and people adapt to the new streets and routes in downtown Florence. Anyone visiting with the aid of a GPS device in the near future be forewarned that your device might tell you to take streets that are no longer open to cars… but bikes and pedestrians are welcome!